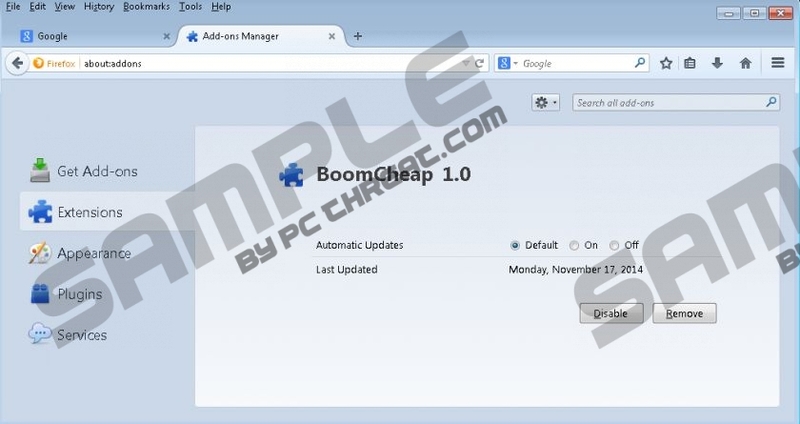 Boomcheap is an unreliable browser extension that can be installed onto your Internet Explorer and Mozilla Firefox web browsers. The application is not presented using an official website; however, its developers often use the services of third-party software distributors. According to our virtual security researchers, the extension may be installed together with programs that you will have to delete from the operating system. Unfortunately, this may complicate Boomcheap removal as well. Even though some computer users claim that Boomcheap infiltrates the browsers and the operating systems illegally and unnoticeably, our malware experts suggest that in most cases users install the add-on by accident. If you accidentally skip the information disclosing the installation of the extension, you should not delete Boomcheap as an illegal program. Of course, this does not change the fact that you must remove the suspicious browser extension. If you do not delete the program, it will bombard you with suspicious online advertisements. Did you know that Boomcheap is a clone of Bestsaveforryeou, DownPay, Unideals, and other programs created on the justplugit engine? We have prepared the removal guides for every single of these clones, but most of them can be deleted using the Boomcheap removal instructions. There is no need to doubt that you have to delete the application if the “By Boomcheap” ads have already appeared on the sites that you visit. These ads are the reason why we identify the suspicious browser add-on as an advertisement-supported program, or adware. Do you understand why you should delete Boomcheap from your operating system? Whether you find the presented ads beneficial or intrusive, it is crucial to understand that these ads open up portals to third-party sites. Is this dangerous? It might be if the ads promote links to sites that are related to drive-by download attacks and various malicious scams. In the worst case scenario, Boomcheap ads could be used to infiltrate more dangerous infections, and this is why you should remove this adware. If you choose to remove Boomcheap manually using the instructions below, you need to be ready to deal with other running infections and the leftover files of the ad-supported program itself. Not many users are skilled enough to perform the manual Boomcheap removal, and so we offer an alternative. Instead of wasting time with the manual removal, you can install automatic malware removal software. This software will also guard your PC in the future, and so there is no reason not to install it. Right-click on the screen of the Metro UI menu and a new tab at the bottom will show up. Click All apps, open the Control Panel menu, and select Uninstall a program. Navigate to the left of the Task Bar and open the Start menu (click the Windows logo). Open the Control Panel menu and then click Uninstall a program. Right-click the application you have chosen to delete from the PC and click Uninstall. Navigate to the left of the Task Bar, open the Start menu, and click Control Panel. Locate the application you wish to get rid of, click it, and select Remove. Quick & tested solution for Boomcheap removal.